Yesterday, as part of Sisterhood #12, my mother and I reunited our copy of The Prayer Box with author, Lisa Wingate. This special book came full circle and what a joyous reunion it was! We had so much fun with Lisa, her mother, Sharon, and the ladies of Gourmet Gallery. We attended an event called, Cooking the Books. Dishes were prepared that were mentioned in The Prayer Box. Delectable crab cakes, sausage balls, and banana beignets were served. The food certainly wasn’t the only thing that was scrumptious! Listening to Lisa relate stories of the book, from inception to culmination, was simply delightful! As she read passages from The Prayer Box, she breathed life into the written words and transported us all to the Outer Banks and into the lives of the citizens of Fairhope. Don’t miss your chance to take this incredible journey. Pre-order your copy of Lisa Wingate’s, The Prayer Box, today! In honor of Iola Poole and The Prayer Box, I have included Emeril’s version of Banana Beignets. Enjoy! Whisk the eggs in a large bowl. Add the banana, flour, milk, sugar, baking powder, and salt, and whisk well to make a smooth batter. Pour enough oil to come halfway up the sides into a large deep pot or electric deep fryer and heat over high heat to 360°F. In batches, without crowding, drop heaping tablespoons of the batter into the hot oil (you can do 6 or 7 beignets at a time) and fry, turning them to brown evenly, about 2 minutes. Using a slotted spoon, transfer to paper towels to drain. 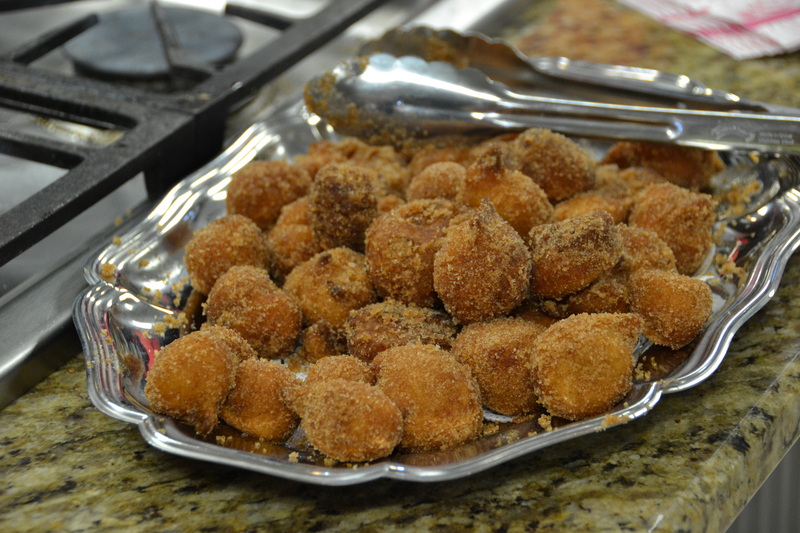 Sift the confectioner’s sugar through a sieve onto the beignets and serve warm.